We are delighted to announce that our latest publication on the decatungstate photocatalytic sp3 C–H aerobic oxidation in flow is now available on the website of Angewandte Chemie (DOI: 10.1002/anie.201800818 ). Here, we would like to share the “logbook” of this scientific journey. Fasten your seatbelts and let’s go! When Tim proposed to start a new, challenging project to develop an aerobic photochemical C–H oxidation method via hydrogen atom transfer catalysis, I did not have to think twice and I accepted enthusiastically. 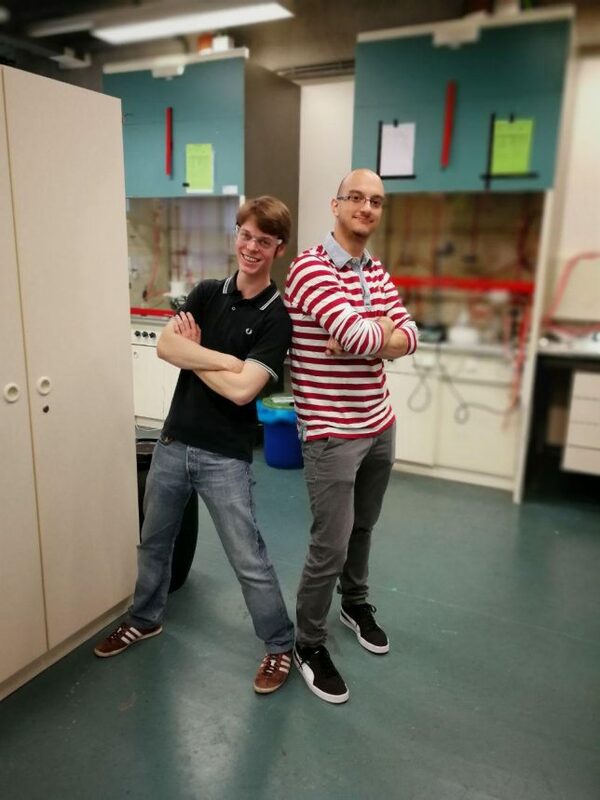 At that point, I was still working together with Hannes to wrap up our meta arylation project and I thought it was the right timing to start thinking about a next high profile target. Furthermore, as a chemist, I think the selective activation of C–H bonds is one of the most interesting topics to work on nowadays. So, in order to develop a new and broadly applicable methodology, every researcher knows what to do first: digging into the literature and see if there are any hints available to start off fast. I spent a couple of weeks trying to understand what would be the best direction. First of all, I noticed that direct C–H oxidation methodologies have been developed either using electrochemistry or using transition metal catalysts (e.g. Fe, Pd, Ir or Mn-based catalysts) that were often not commercially available. Second, I learned that the oligomer decatungstate (particularly tetrabutylammonium decatungstate (TBADT)) was recently used for many cross-coupling reactions (many of them carried out by Prof. Fagnoni’s group), for fluorination chemistry and for the oxidation of alcohols. To Tim and myself, it seemed that this relatively underrepresented catalyst could be effective for the targeted transformation. Indeed, during the past 30 years, a few reports appeared on the oxidation of C–H bonds using TBADT, in most cases hydrogen peroxide was used as the oxidant. However, it became very clear to me that this transformation has never been explored in great detail. At that point, I summarized all of this information and prepared a powerpoint presentation to outline my ideas during a Science Meeting presentation in the Noel Research Group. Fortunately, Tim and the other members of our group liked my proposed strategy and we set out to do the first experiments. Since we had little to no experience with TBADT, we asked Prof. Maurizio Fagnoni and Dr. Davide Ravelli to collaborate with us, to teach us some tricks on the synthesis of TBADT and to discuss the obtained results. Moreover, Tim presented the idea to Steve Djuric from Abbvie and they were also very interested to join this collaborative effort. Together with my new MSc student Sebastian Govaerts, we kicked off the work carrying out some batch optimizations. From the very beginning, we noticed that the oxidation of cyclohexane (our benchmark at that stage) was very slow: only traces of product were observed after 4 hours of irradiation. It was immediately clear that we had to change some key parameters. We thought that the main reasons for failure were the limited amount of oxygen available in the reaction mixture and the low light intensity. Inspired by Prof. Fagnoni’s work, we subsequently carried out the oxidation in so-called window ledge glassware using a solar simulator as the light source (Figure 2). This allowed us to have a higher interfacial area (and thus higher oxygen availability) and it provided a greater exposure to light. Luckily, this time the reaction worked better and we saw some conversion. During the subsequent optimization studies, we found that the addition of acid was crucial to accelerating the oxidation process, while basic reaction conditions shut down the reaction. However, mass transfer of oxygen from the gas to the liquid phase remained challenging and this was for us the signal to move to flow. From our previous work, we were sure that the combination of a segmented flow regime with the enhanced irradiation provided by microreactors should be able to dramatically boost the reaction performance. And indeed, the first results were immediately better than the best batch experiments. After a meticulous optimization, we were able to obtain full conversion for our benchmark in only 45 minutes of residence time in a 5 mL capillary reactor (Figure 3b and c). We used 365 nm LEDs as it perfectly overlaps with the absorption maximum of TBADT. Other LEDs, such as blue and purple coloured ones, proved ineffective. Interestingly, during our optimizations, we noticed that higher oxygen pressures did not affect the reaction rate, indicating that the liquid phase was saturated with oxygen even at atmospheric pressure. Furthermore, we observed that when the reaction went to full conversion, a deep blue colour appeared towards the end of the reactor coil. This points towards an inactive catalyst and provides a visual indication that the reaction was successful! All these small (but useful) pieces of information helped us a lot during the first part of the work. Figure 3 (A) Reaction scheme; (B) picture of the continuous-flow setup used in this work; c) Comparison between the conversion of cyclohexane in batch and flow. Once we were satisfied with the reaction conditions, we decided to start investigating its robustness. Initially, we were screening a whole variety of different toluene substrates. However, none appeared to give any product. 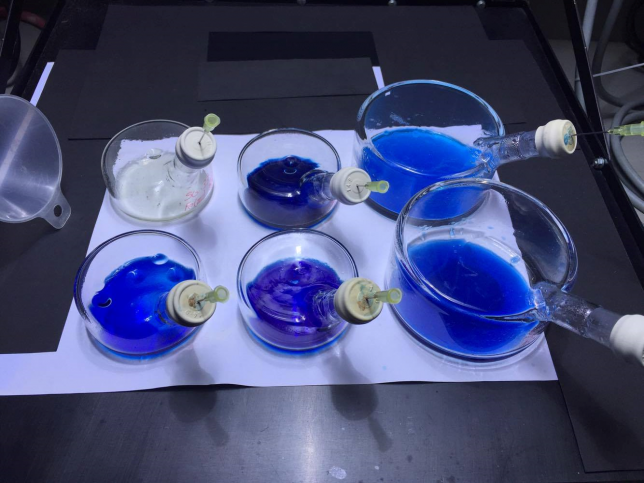 All these unsuccessful results could be actually visually predicted as the liquid slugs turned deep blue over the entire length of the reactor (Figure 4a). Again, this shows that the catalyst is inactive. Other compounds like amino acids and amines were overoxidized under our reaction conditions giving very complex mixtures (Figure 4c). However, despite these failures, we got a lot of insight into the mechanism and the reactivity profile of the method. E.g. while toluenes could not be oxidized to their corresponding benzaldehydes, we were able to target other positions selectively. To make a long story short, we were able to oxidize a wide variety of different substrates containing both activated and unactivated C–H bonds, even including some biologically active molecules products such as pregnenolone acetate, sclareolide, and artemisinin. The purification of the products was often challenging as they were in some cases quite volatile. Hanging the flask a bit too long on the vacuum line was enough to have to start all over. 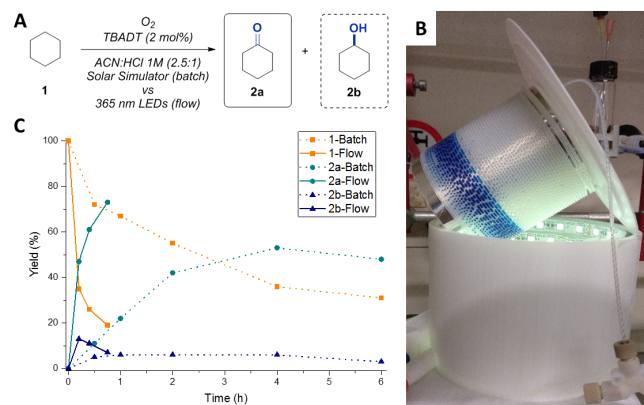 Since we used continuous flow for the synthesis of our entire scope, the reaction conditions proved readily scalable. As an example, we were able to obtain about 870 mg of artemisitone-9, which corresponds to an isolated yield of 59%. Figure 5 Schematic overview of the photomicroreactor setup and some biologically active substrates which could be oxidized successfully. 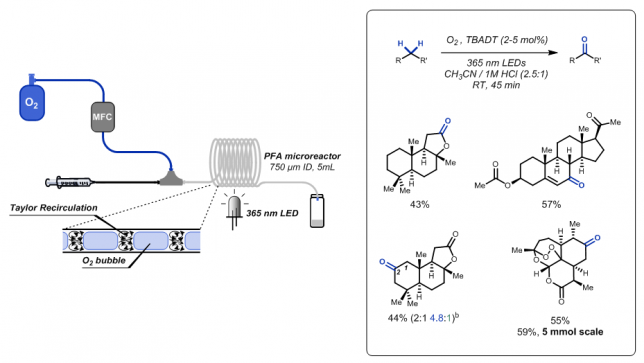 Regarding this project, I think that our photochemical C−H oxidation can be a valid alternative to the strategies reported so far. The employment of a commercially available (or even better – synthesize it yourself, it is very easy) catalyst, together with a mild and inexpensive oxidant like molecular oxygen, are the winning features of this process. On top of that, it was very pleasant to develop a procedure which really benefits from continuous-flow processing. In line with the philosophy of our group, continuous-flow microreactor technology is only a useful alternative to batch if it really improves the process significantly. I firmly believe that this work is a strong example of the benefits of microreactor technology. Finally, I would like to thank everyone who helped and contributed to the success of this scientific journey including my co-authors and the people in our group. A special thanks to Sebastian who worked side-by-side with me in the lab, helping and pushing me with his constructive criticism when a result was simply not good enough. It made the paper in the end much better! Finally, my gratitude goes to Tim, who gave me the chance to work on this very intriguing, challenging and pleasant project and supported me during all the difficult moments (e.g. low reactivity, compound disappeared due to volatility, etc.). The paper discussed in this blog was published as Selective sp3 C–H Aerobic Oxidation enabled by Decatungstate Photocatalysis in Flow. Gabriele Laudadio, Sebastian Govaerts, Ying Wang, Davide Ravelli, Hannes F. Koolman, Maurizio Fagnoni, Stevan W. Djuric, T. Noël, Angew. Chem. Int. Ed. DOI: 10.1002/anie.201800818.